Step 1. Cut black cardstock (to measure 8 1/2 inches by 5 1/2 inches) and score it at 6 1/2 inches. Step 8. Cut decorative strip the Eat Drink & Be Scary patterned paper ( 1 7/8 by 5 1/2 inches) for the inside & cut a black cardstock mat ( 2 1/8 by 5 1/2 inches) Mount them on the inside. 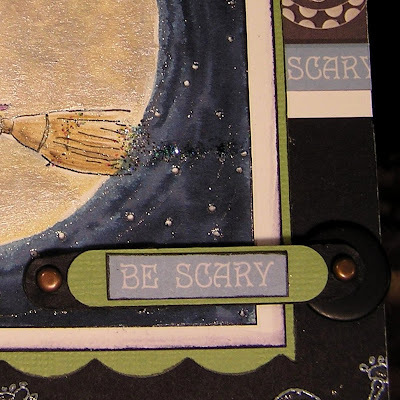 This witch stamp is frighteningly fun to colour-right down to the wee wart on her chin! :O) I used watercolour pencils & Niji watercolour brush. To paint the sky, I used a marker into wet paint wash technique. Dilute a navy water-based marker with water & paint it on with a Niji watercolour brush. Then go back in with the marker. to create rings. Step 3. Make stars & Bling: Pierce the cardstock to put stars in the sky & Add glimmer with Sakura Star dust Gelly Roll Pen around the stars (and on the witch.) Crystal Ice Stickles looks wicked on the back of her broom. Step 4. Mat & mount the image: Edge the white cardstock mat with black marker (4 3/8 by 4 3/8 inches square) Mount the witch on the white mat. The holes will show the white through like stars. Add the Bits of Eat Drink & Be Scary patterned paper (1/2 by 1 7/8 inches & 3/4 by 1 7/8 inches) to the White mat (2 2/8 by 5 1/2 inches)at the left and right & Adhere it to the card front. Mount the Witch image off to the left. Add a hand cut bit of black cardstock, the two antique copper brads, and another black layer. Adhere the sentiment to the image & to the button using Oh So Sticky Tape. This card is awesome! I'm going to have to try that marker technique because your sky around the moon looks amazing!! Great job! I love the cards you are doing at the moment, so adorable and make me laugh. The the sky and moon whow!! That is just as beautiful as it can be! Very cool ideas with the stars and paper piercing, love your watercoloring a lot! Thank for sharing with us all your wonderful ideas! The sky the moon and stars looks so stinkin cool! Your are ROCKING on these ECG images! WOWZERS! So inspiring! oh wow I LOVE how you made that sky! fabulous!! and that little dusty trail from her broom is such a neat detail. Very cool art! I have been watching all of the wonderful creations you've been making with the Paper Garden kits and decided to go ahead and get one only to find out that they are both sold out! I'll know for next time to order earlier. Wow, What an amazing collection you've done here!! Waiting with bated breathe for the last huurrah. You're so good they even appear while you're away. amazing!!! Hope your unpacking and body/time change adjustments went smoothly. I love the way you did the stars! How brilliant. And the rings are great too. Of course the colouring on the witch is splendid, it's all great!! I love the sky around the moon! Good job!! Oh Mel ! I just totally am smitten with this card! I love that Witch! WOW this is awesome!! I totally love your sky and everything else!! love your little sentiment....what a funny image! Gorgeousness Mel-A-Licious!!! LOVE it ... you da bombetta of Halloween projects! That witch sure looks witchy! LOL! Another great card, Mel! I love the skeletons on the black cardstock. Too cool! And, you did a beautiful job coloring that witch!! Thanks for the tutorial!! Another awesome card, Mel!! Love the color blending and gleam of sparkle! Wow - so many wonderful details on this awesome card!! I love your witch!! Wow - what a great card! I love it!